BRANSON, Mo. -An arrest warrant has been issued for 68-year-old Thomas Phillip Brown after his wife was found dead from bullet wounds inflicted in room 182 of the Ramada Resort and Conference center on Branson's 76 Strip. The probable cause statement used to issue the arrest warrant revealed Marilyn Brown, Thomas Brown's wife checked into the hotel room as temporary shelter on Feb. 21, 2013 after being displaced from their residence. The Brown's recently relocated from Palm Springs, Calif. and according to one family member against Thomas Brown's will. A hotel housekeeper found Marilyn Brown on Feb., 24 2013. Digital keys log no other entry to the room except for Thomas Brown's keycard..
Thomas Brown is "known to carry a firearm" and has worked as a security guard in the past. He is likely to be traveling with the family dog in a blue Dodge Durango California License Plate # 5WR-F678. *The probable cause statement also indicates there were no signs of struggle at the crime scene. Coverdell's Landing aka North Beach Park is a mecca rich with old growth trees and honey holes ripe enough for even the average trout fisherman to reach his limit. At one time the park was slated for construction but court records show Branson testified to not owning the property halting bulldozers leveling everything surrounding the peninsula including a liberty tree. The City of Branson is throwing "Hail Mary's" begging multiple courts with conflicting stories to grant a verdict favoring Empire District Electric in disregard to a 1970 Warranty Deed claiming 35% of the property known as the Branson Landing. At the helm Branson has hired outside counsel, one of a dozen firms hired since current Mayor Raeanne Presley started a multi-million dollar deficit spending spree that has lasted since taking office. Presley was involved in litigation with the city before competition was disqualified leaving her the sole choice on an election ballot. And while Presley is the first mayor in Branson's history to run a negative annual balance, the process is fascinating to watch in the courtroom. In fact, since the Mayor's arch enemy Andy Williams passed -, the Taney County Courthouse is the best show in the Branson area. It also happens to the most pricey. While Branson doesn't claim to own the land; the implications of fact put the municipality extensively exposed.When the city set out to build on the Lake Taneycomo waterfront they offered numerous property owners quick claim deeds, they neglected a large chunk due to shoddy research. When legal counsel for the city became aware of the mistake in the early 90's they developed a leasing strategy in collboration with Empire District Electric. While appearing enemies in court they were negotiating the system to corner Coverdell out of title ownership. A strategy of perpetual litigation blocked Coverdell from possessing the land the warranty deed said he owned until a jury was able to review the case. When a Taney County jury upheld Coverdell's claim of ownership the city responded with a new team of counsel. Due to the incestuous political and attorney relationships there has been plenty of help. The attorneys seem to rotate to different parties - banks, utility companies, political entities reaching their hands from different perspectives. While the attorney's clients change the claim of ownership for the same piece of land remains concistent. At one hearing no less than eight attorneys stood against Coverdell; a strategy Coverdell didn't seem to mind as it would have played well to most juries. But the money flows everywhere but to a settlement once offered for pennies on the dollar. While calamity for the city seemed certain, former Supreme Court Judge John Holstein entered the case on behalf of the city of Branson. Holstein argued to the Missouri Southern District Branson's ignorrance to Coverdell's title and the opposite in Federal Court. In order to sue for millions in title insurance damage not only did Holstein claim knowledge to Coverdell's title in the early 90's but submitted Branson's legal correspondence detailing both knowledge and strategy. It is Holstein that has proved to be the most interesting component of the case. During arguments he's ruthless, not with his knowledge of the law but rather audacity to forward arguments - arguments other counsel wouldn't dare submit. 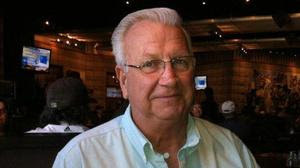 Holstein, who is the father-in-law of the Branson City Attorney who negotiated the Branson Landing, Paul Link, claims to bill $750.00 hourly standard and further claims to be charging the city a discounted $350.00 per hour for charitable purposes. While the City of Branson claims Sunshine Requests made verbally in open meetings do not have to be answered as statute demands, court records affirm Holstein's billing rate statements are true. Local court customs are foreign to Holstein. Local attorney's grant time liberally as common courtesy preventing defaults before the court can hear their clients cause. Contrarily, Holstein is ruthless in pursuit of his clients interests. During a simple entry motion last month the city was billed in excess of $10k for an entry motion to dismiss Coverdell's case. Generally these types of motions are quickly tossed by the judiciary. And while the threat of sanctions hoovers before the Federal Court (Holstein is demanding all legal correspondence) sanctions are threatened against several title companies. Holstein's strategy is effective twofold. On one hand the sheer cost of defending against an entity with little regard for fiscal sanity should have overwhelmed Coverdell, In addition Holstein has charisma and is highly respected inciting judges at times to overlook both fact and statute. The judicial seems to overlook even the most common procedures. During oral arguments to the Missouri Southern District Court of Appeals, Holstein presented maps which weren't presented in trial and claimed Coverdell's victory would encumber infracstructure created 30 years after the warranty deed being disputed was issued. If it weren't for Coverdell's counselor Robert W. Cockerham, the case would surely be lost. Cokerham and Holstein seem to be a fair match in recent hearings. Holstein's clout is matched by Cockerham's ability to recount hundreds of details instantaneously and in one hearing backed each statement with caselaw citing Holstein's rulings. If Holstein is ultimately victorious he will have to counter many of his own rulings in trial. But victory for Branson is bittersweet. An arrogant attitude has cost the town of 10,000 citizens millions in the courtroom. The absent press has complicated the matter relying on statements from Branson counsel. The only victory thus far for Branson is on the Public Relations front. The mayor's media relationships, including equity in the corporations broadcasting information about the case has quelled detail successfully. The other winners are the heirs of the Plaster Empire. Before passing Robert Plaster was well known. In the 1970's the US Justice Department accused him of unfair business practices to gain a monopoly in the propane industry including threatening competitors. The Justice Department filed charges again after a 1970's accusing him of hiring two men to blow up a competitor's gas tank with a 10 stick dynamite bomb. F. Lee Bailey earned Plaster an aquittal after a three week trial paving the way for one of the largest propane companies in the United States. In the 1990's plaster was known for his charitable donations and locally for an attempt to bring gambling to the Branson area through a project in Stone County he'd hoped could be designated as a Native American reserve. According to sources with equity in the Branson Landing project, the Plaster family has increased their holding in the Branson Landing. While dozens of hearings have been scheduled the court hasn't determined whether cameras will be allowed inside or not. Branson's mayor has a partnership with Schurz through which all media requests for cameras in the Taney County Courts have to be submitted. And while the case isn't being followed locally national interest is rising commanding facts relating to the case will have increased public awareness.